I love garlic’s complexity, and it’s a great way to add flavour to almost any savoury recipe. It’s extra stinky (and extra good for you) when eaten raw, but when you cook it, it becomes this amazing mix of pungent and sweet. Garlic’s nickname is “the stinking rose,” but it’s actually a member of the lily family, just like onions, chives and leeks. It’s one ancient veggie, and has been cultivated for at least 5000 years. There were even bulbs of garlic found in King Tut’s tomb! But tasty as it is, garlic’s first use wasn’t as a food, but as a healing herb. Garlic was a staple in ancient Sumerian, Egyptian, Chinese and Indian medicine cabinets. 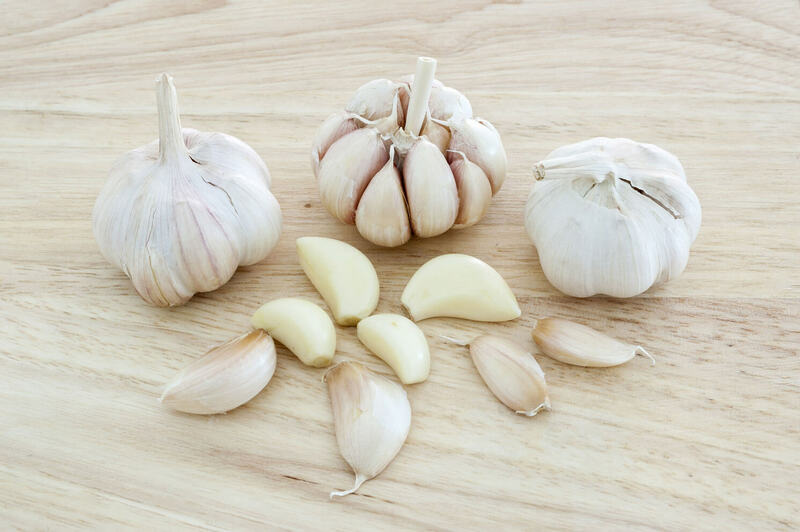 These days, garlic tends to live exclusively in the kitchen pantry, as modern medicines have replaced what used to be known as “Russian Penicillin” in most homes, but that doesn’t mean that garlic has lost any of its health-boosting benefits! Why take tons of tasteless pills supplements when you can get tons of healthy herbal benefits cooked right into your meals? Garlic contains sulfur compounds that not only give it its characteristic stinkyness, but also have tons of health benefits for all your body’s systems. Lowers blood-pressure. The sulfur compounds in garlic that give it its characteristic smell may also help lower blood pressure . Reduces LDL cholesterol. Garlic has another heart health benefit in that those same sulfur compounds also help reduce LDL, or “bad” cholesterol, as well as triglycerides in the bloodstream. Anti-inflammatory. Garlic’s anti-inflammatory capacity pairs nicely with the two benefits above to make it a heart health superfood, but those anti-inflammatory benefits work across your whole body! Antibacterial, antifungal and antiviral. Garlic is a microbe-killing machine! Research has shown that the chemical components in garlic are capable of taking out everything from Candida albicans (the fungus that causes yeast infections) to H. pylori bacteria (which cause stomach ulcers). Cancer fighter. You’ve probably heard of the cancer-preventing benefits of cruciferous veggies like broccoli and kale, but did you know that those green veggies contain sulfur compounds that give them their health benefits, just like garlic? Studies have shown that when it comes to cancer prevention and garlic consumption, more is more! While moderate consumption of garlic lowers the risk of two types of cancer, high consumption of garlic may be linked to prevention to all but two types of cancer (breast and prostate), so feel free to stink it up! Helps with iron metabolism. 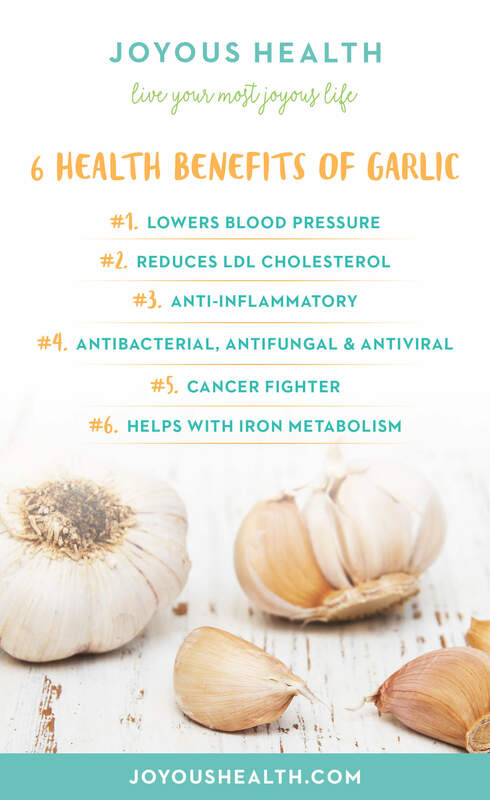 Even though there’s not really any iron in the garlic itself, studies show that garlic can help you absorb iron by encouraging your body to make ferroportin, a protein that helps bring iron into your body’s cells. Here are some of my favourite garlic-containing recipes so you can start taking advantage of this super-healing superfood! Do you love garlic as much as I do, and add extra to recipes that already call for it? What’s your favourite super-stinky extra-garlicky food to make? Let me know in the comments below! Love these benefits! I eat so much garlic even more now then ever by following all your recipes. Tonight we had the Acorn squash soup from your blog. Deeeeeeelish! I especially love the garlic from the Hemp Seed Gauc as well as your Pesto recipes. Yummers! It reduce the blood pressure. It improve the Bones health and lower risk of heart disease. Garlic really bloats me but i still eat it because of its healthy benefits .... thoughts on completely cutting it out since if causes me discomfort? Hi Joy, its true that garlic is very beneficial in low blood pressure, reducing LDL cholesterol, anti-inflammatory, fungal and viral infection, treating cancer, and increasing metabolism.